This is our favorite time of the year. Thanks to Daylight Saving Time, the days are longer and Opening Day for the Padres is just around the corner. The arrival of spring means sunny days, starry nights and spending as much time as possible outside. For dog lovers, this time of the year is especially fun because many restaurants and bars often step up their Yappy Hours. Here are some happening spots in 92101 that are Fido-friendly. The next time you head out to happy hour, bring your four-legged friend to Canine Cocktails at Hotel Indigo on 509 Ninth Ave. The popular event is held once a month at the hotel’s Level 9 Rooftop bar from 5:30 – 9 p.m. If you haven’t been to this particular lounge, it has a cool vibe and an amazing view of Petco Park. 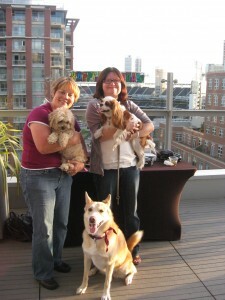 Yappy Hour prices include $5 well drinks and draft beers. They also offer dog treats, and guests can buy raffle tickets for a chance to win a goodie bag. Patrick McTigue, director of sales and marketing at Hotel Indigo, said the event is a big hit with locals and hotel guests. “Everyone always has a great time and baseball season certainly adds to the draw,” he said. The date of Canine Cocktails changes every month, but it’s always held on a Thursday. The next one will be March 15 and will have a St. Patrick’s Day theme so don’t forget to wear your green. Insider’s Tip: Before you head upstairs, be sure you look at the beautiful glass sculpture at the top of the building. It’s a true hidden gem that is often overlooked called “Indigo Waters,” a sculpture created by local artist Lisa Schirmer. The Friday night Padre games often have fireworks and the rooftop is a great spot to see the show. Another popular outdoor dog-friendly delight can be found at Sally’s Seafood on the Water in Seaport Village. 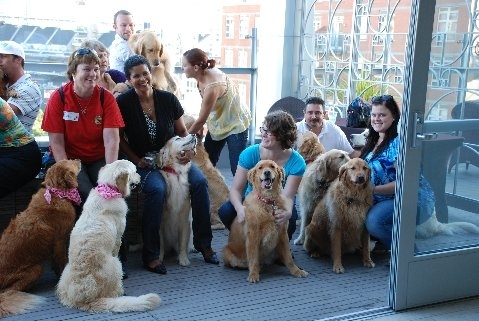 Held on Thursday nights on their outdoor patio from 5 – 7 p.m., this is an ideal spot to relax with a glass of wine with other dog lovers. 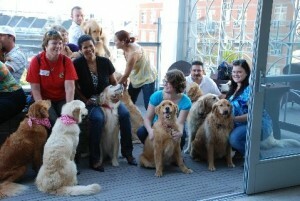 This is the fourth year Sally’s has offered a Yappy Hour and every year, it draws a nice crowd. Well drinks and house wine go for $5, while draft beers are $3. Some of the more popular appetizers, which are all 50 percent off, include crab cakes, spring rolls and tempura shrimp. In Little Italy, Davanti Enotecahas a happy hour every night from 4 – 6 p.m. This is a cool Italian restaurant that recently opened on 1655 India St. The restaurant’s patio courtyard in the back and the new front patio are dog friendly and make for a great place to hang out with your four-legged friends. Their happy hour menu includes $5 house red or white wines, $4 craft beers and $6 wells. Appetizers are half off and include bruschetta, pizza and burgers. Heavenly Cupcake is in the Gaslamp Quarter is a hidden gem that believes in spoiling your canine companion. Their Heavenly Pupcakes are $2 and are made with dog-friendly ingredients: carrots, whole-wheat flour, peanut butter, honey and cream cheese. Doggie decorations are made of fondant, which includes sugar, glucose sugar and food coloring. Insider’s tip: The second Wednesday of every month is a good day to visit Heavenly Cupcake. They do a complimentary cupcake tasting event. March 14 is the next tasting extravaganza. We want to hear from you: The finest street performers in all the land will be at the Busker Festival in Seaport Village March 24 and 25. Take a photo of you and some friends with someone from the Mango-Dango Show. The most creative picture will win two tickets to a Saturday public Scavenger Hunt with WYWTB Tours and two tickets to a Discover Coronado Biking Adventure. E-mail your photo to tours@wheretours.com by March 20.